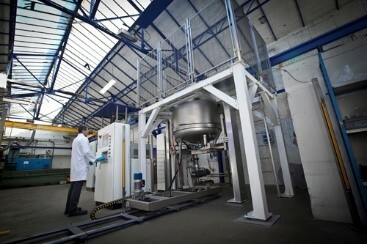 Thermi-Lyon is a small company specializing in heat treatment and coating in a vacuum. On the site of Lyon, the company has several types of ovens (carburizing, nitriding, hardening...) and associated utilities (production of compressed air, hydraulic system of cooling...). In this industry, energy is an important item of expenditure. This is confirmed at Thermi-Lyon where energy represents almost 10% of the turnover. Aware of this issue of competitiveness, the company in the EE-METAL program to continue its efforts on energy efficiency. All of the energy saving measures identified during the audit represents a potential of close to 20% of annual energy consumption. Other actions will be studied in order to continue to improve the energy efficiency of the company (the performance of processors increase, optimization of the temperatures and the operating time of the furnaces, insulation of ovens... ).